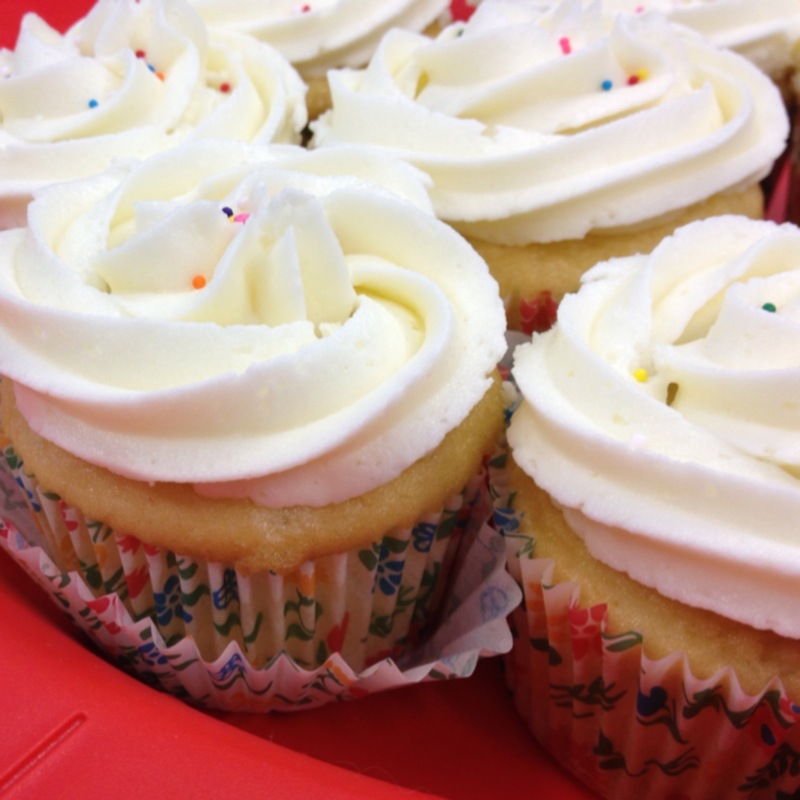 As you know, my last batch of cupcakes were lovely little morsels – not too sweet, great texture, good flavor combinations. So, as I began making cupcakes last night, I admit that I was feeling a little bit cocky. I made the cupcakes (Funfetti, from a box) and was so impressed with the amount of mess I made (none) and the texture of the batter. I filled my little plaid liners and popped them into the oven, feeling good. I even did a load of dishes and updated my blog while they were baking. They came out good (not great – I have issues with getting the size of the two separate batches to be the same… but I’m working on it), so I set them aside to cool while I started the frosting. This is where things started to go wrong. I was making a Marshmallow Cream Cheese frosting (found on Pinterest, here). In my abundant confidence, I hadn’t made any preparations that morning, so my cream cheese wasn’t softened. No problem, I thought, I know how to soften this right up! I filled a glass bowl with hot water and tossed the still-wrapped cream cheese in, letting it soak in the hot water for about 20 seconds. As I was cutting it up to put into the mixer, I noticed that it wasn’t as soft as I would’ve liked (aka as soft as it would’ve been if I’d let it sit on the counter all day, as intended) but, still aglow in the success of my last batch of cupcakes, I told myself it was fine. Next I tossed in the vanilla extract. No problems there. I turned the mixer on and let it mix for quite some time, reasonably sure that nothing man-made could force this marshmallow fluff to mix with anything. 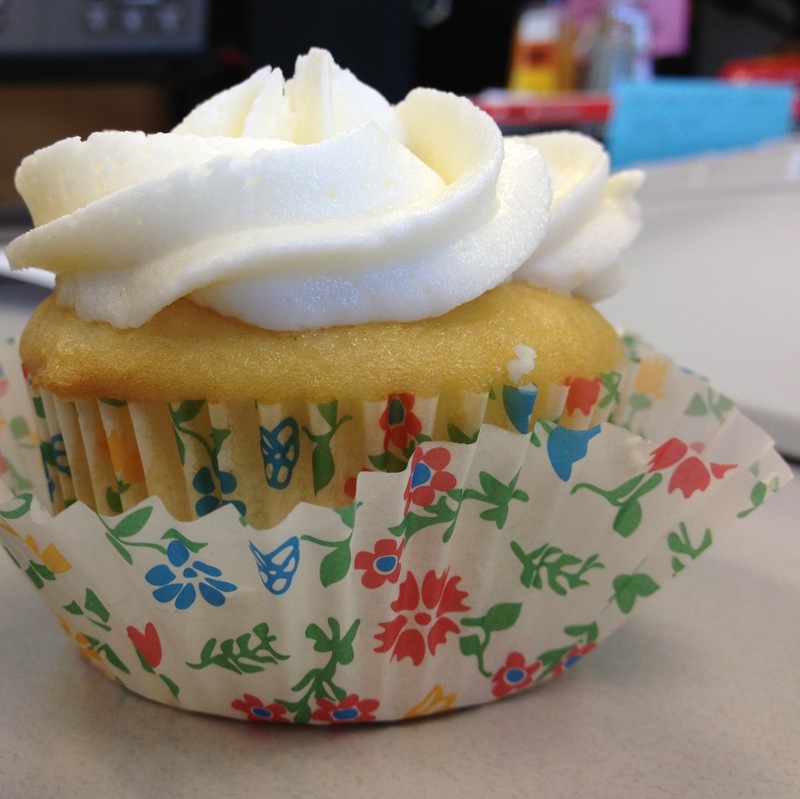 After a couple of minutes, though, it actually resembled a nice textured frosting, free of grit since it had no sugar. I brought the demon cakes to work and they are a big hit. People love the frosting. So, there you have it. An incredibly long blog post for a very short, [theoretically] easy recipe. 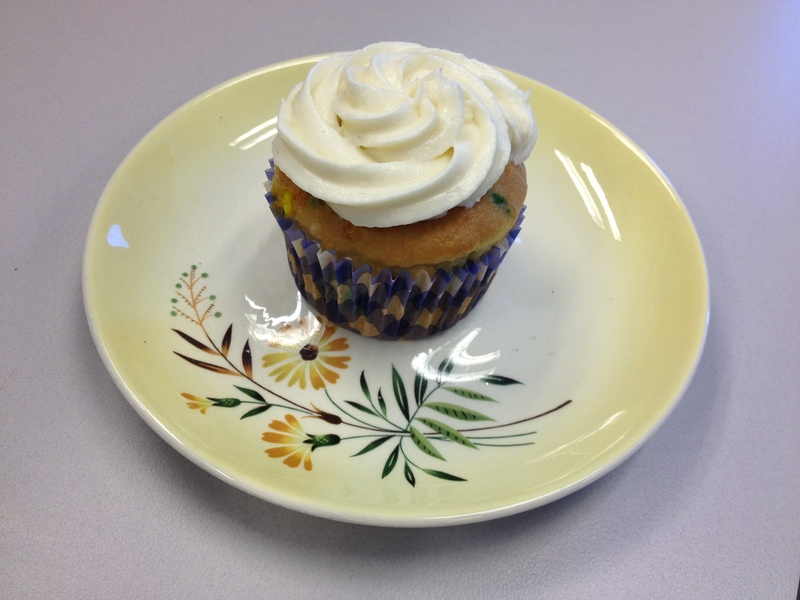 I was trying to think of something clever (okay, cheesy) to call a “Cupcake Update”… like Cupdate but I haven’t had my coffee yet today, so nothing came to mind. For the Cupcake Recap, I made white cupcakes (just from a box mix but I did do the whole egg variation because I didn’t feel like dealing with egg whites) with cream soda frosting. 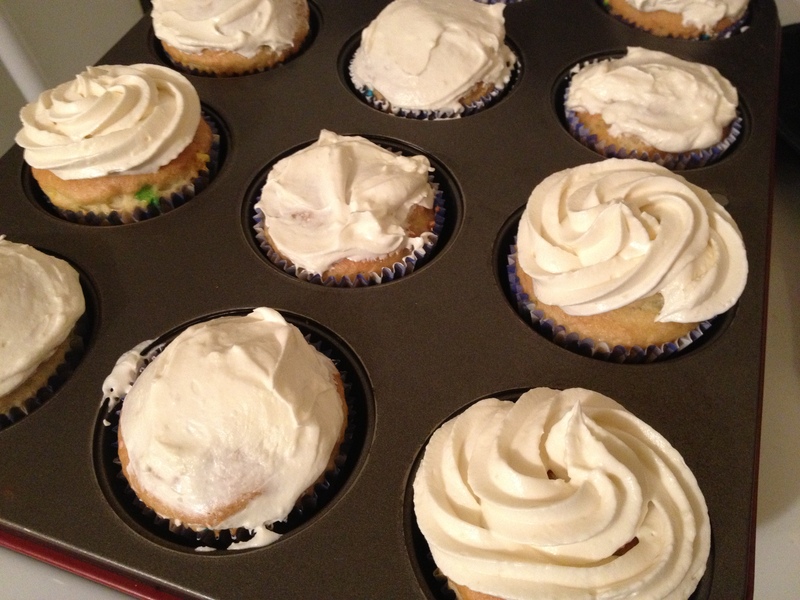 The cream soda frosting is a variation of some champagne frosting I made on New Years Eve. It was definitely creamier with the champagne, but the mixer was giving me grief this week, so that could’ve been the issue, too. * With electric mixer, beat together sugar and butter on low until blended, then for another two minutes on medium. * Add vanilla and soda. Beat on medium for another minute. 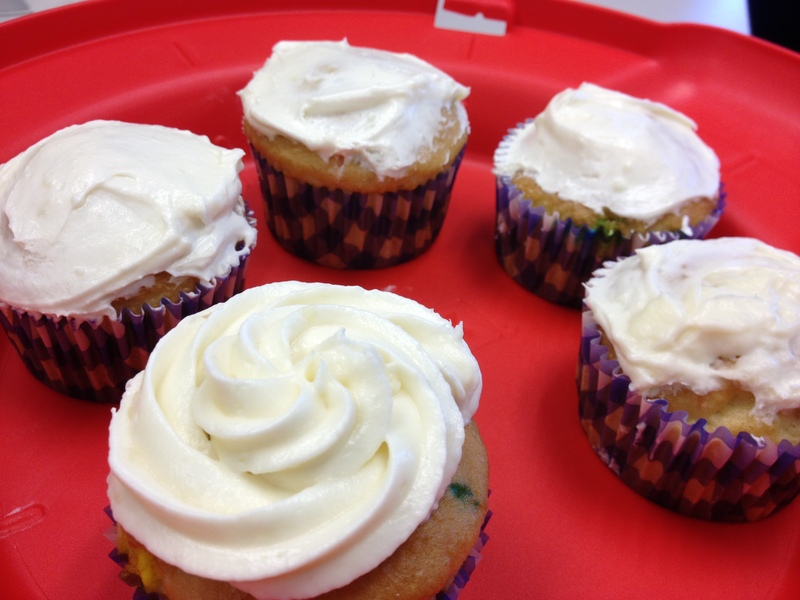 They came out pretty lovely, actually – the cream soda frosting was a good match to the plainer white cake mix.